After the update to 0.8.39 no more data was logged to Insights anymore. Doing a reset with erase and starting all over again did not fix this for me. I'm not putting anymore time in this. On 0.8.35 Generic Alarm is not available, neither secure nor non-secure. Click on the big plus in the zone you want to add the device, and select Z-Wave in the Select your device type... dialog. When the Follow the instructions... dialog is displayed you have to click the Action Button on the bottom of the sensor. After you press the Action Button homey will interview the device. When the interview is done homey will ask you What type of device is this? and if all went well the devicetype sensor should be shown. In this dialog you can also change the name of the device. When you click next you will be back in the Zones & Devices screen. When you hover your mouse over the device you just created two icons will show in the top left corner. When the sensor is first added it's very likely that the Generic Alarm is on, when adding the device it was most likely activated so that state was added. When the sensor is added secure the Motion Alarm and Generic Alarm are visible but will not be triggered. 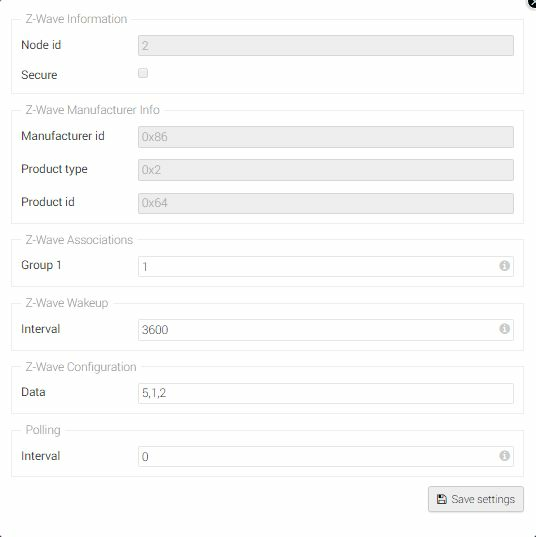 When the Multi Sensor is added to a Z-Wave network containing a SIS (Static ID Server) or SUC (Static Update Controller), it will be associated to the SIS or SUC automaticly. Homey has the SIS role so the Z-wave Associotion for Group 1 will automaticly be set to 1 which is the device number of your Homey. When just added the data field is empty, in order to get the basic functionalities of the Multi Sensor working you will have to add 5,1,2. This will tell the sensor that it has to send Sensor Binary Report CC instead of Basic Set CC which is required by homey. After adding that click on the Save settings button and close the dialog. When the Sensor is battery powered, you have to wakeup the device in order for it to receive the new settings. Information from the Multi Sensor or the Multi Sensor itself will not show up in Insights untill data is sent to homey. So, to make it available in Insights, agitate the sensor so that the Tamper- and Motion Alarm is triggered. The Motion Alarm will only be triggered after the sensor received the 5,1,2 settings and a minimum of 4 minutes have passed since the last motion was detected. The Tamper, Motion and Generic Alarm are shown as the verticle bars. Note that an actual detected movement is shown as a single verticale line at the time of the detected movement. At the same time the Generic Alarm is triggered which stays on for 4 minutes after the last movement is detected. When the Generic Alarm is triggered, now new Motion Alarm will be triggered! The Humidity, Luminance, Temperature and Battery are shown as the lines, when you hover your mouse over a particular line the value at that point will be shown. The Multi Sensor can be used in flows in the when column as a trigger or in the then column to take an action on it. It can not be used in the and column. A work around for that is to use a different flow to save the value of any sensor to a variable and use that in the and column. 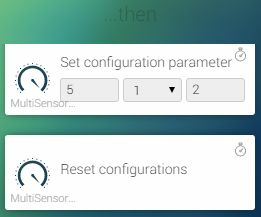 Looking forward to you experience in optimizing the settings to increase the report interval (without changing the wakeup interval)... With the Fibaro motion sensor this is not possible at this moment. I can tell you that increasing the report interval without changing the wake-up interval will not work. That is mentioned in the engineering sheet and I've tested that. What should be possible is to change the 'delta' threshold at which a report is sent regardless of the interval, though I've not been able yet to accomplish that. Maybe it's a idea to make a category with Devices and there configuration settings? Like this? In the nearby future, Apps will do this as they 'preconfigure' zwave devices. @Emile good to hear... what is the timing for these apps to become available? Depending on the timing, the community might need to setup their own overview of Devices and configuration settings. Only problem i now seem to have is that generic alarm is Always on on all of my 4 motion sensors. Did a complete zwave reset to be sure and again i have a constant generic alarm. Motion and tamper get trigger nicely by the main status of the sensor is Always blinking alarm because of the generic alarm. Yeah, if the Motion Alarm was triggered when you pressed the Action Button (which is very likely) than the Generic Alarm in the sensor was on during the interview. This Generic Alarm will clear after there is not motion detected for 4 minutes (default). Make sure you absolutelu don't trigger the sensor for some time. Also, when the Generic Alarm is active and there is motion detected, the sensor's led will NOT light up. So it's probably best to put the sensor in a closet or another room for a while. Just an observation; Not related to homey, but good to know. When USB power is used on the sensor, the temperature seems to be 4.2 degrees higher than on a battery powered sensor. The red line is the sensor that was USB powered, the orange battery powered. I switched that at approximatly 7:20 and at the next report the temperature difference had switched. it took a few hours but now suddenly the generic alarm is off. Now is also works as expected. Alrm triggerd and generic stays on for a few minutes and the. turns of again. So what are we doing wrong or would be a potential fix? Just read the lux-value to a variable every minute and test the variable? so how can we get the lux variable into the 'and' logic app part? As the trigger (when) would NOT be the lux change, it would/should be motion or something. holy crap - cool i will ask my friend to try! thanks! Cool got from the friend that it is def. going in the right direction! Which can heavily be influenced by time, weather, door open or closed in hallway. Thanks for the instructions @BasVanDenBosch ! But i cannot seem to get the lux value to update when it registers change. It only updates once per hour.... I tested this by setting up the sensor in a box to get a value below 100 lx. Triggered the motion sensor and it works. The Insight screenshot in the first post also shows that the luminance value is very unpredictable. 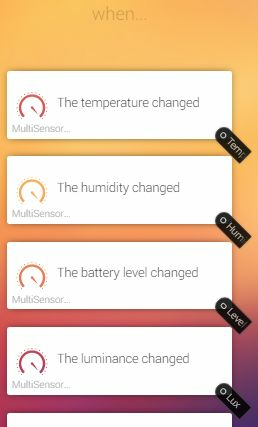 The sensor doesn't send a new value when there's a change. 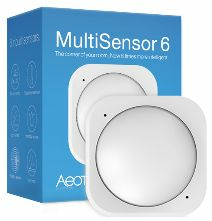 Is there a way to force a value update upon triggering the motion sensor? No polling required for this sensor. The problem I seem to run into that reporting (or handling the reports) somehow stops after a while. Can't yet find a pattern so not sure what or why it happens. I guess my post crossed JeroenVinkes post, I replied to ericjanvanputten regarding the update interval. If you have Zwave wakeup at 1800 then you shouldn't have to set parameter 111? What happens if you set parameter 111 and wakup at 3600? Yes, they need to be set both. If 111 is at 1800 and wakeup at 3600 it will still be an hour and also if it's the other way around. @DaneeDeKruyff would you be so kind to create a short youtube movie on how you add the sensor properly to Homey? Me only manage to connect Luminance and temperature and general alarm . How can I get the rest of it? What firmware are you on? Did you add it secure or non-secure? Did you add extra parameters? Did you agitate the sensor after adding it? When i put the sensor near by the homey i get all the functions but the alarm stays on continu. What means "agitate the sensor"? thanks for the comment Danee. By agitate I mean tapping on it, moving it, shaking it. (Maw. De sensor 'pesten') That way you'll trigger the tamper alarm. I also found out that having patience is a must, these sensors report once an hour in default settings. So after saving a setting you will have to wait at max one hour before the setting is send to the sensor and another hour before the results of the setting can be seen. Sometime a report is missed and you'll have to wait 2 hours! Thanks Danee for the good explanation. !